Dubai: MODUL University Dubai, a subsidiary of Dubai Investments PJSC and Austria’s leading international private university in the Middle East, is showcasing its academic and executive programs and leading a certified training masterclass on digital marketing in the hospitality industry at the Hotel Show, under way at Dubai World Trade Centre. MODUL University, the first-of-its-kind university specialized in tourism and hospitality courses in the region, is currently welcoming its first batch of students at its new campus at ONE JLT, Jumeirah Lakes Towers. At The Hotel Show, MODUL University is conducting a masterclass on ‘Developing a Digital Marketing Strategy for Revenue Optimisation’ as part of the Vision Conference. 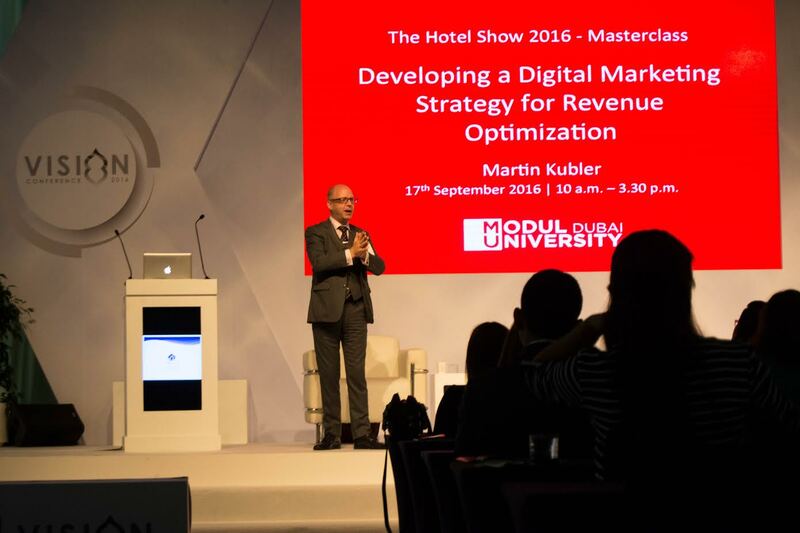 Being conducted by Martin Kubler, Lead Lecturer at MODUL University Dubai, the masterclass focuses on insights needed by today’s hoteliers to optimise revenue through digital marketing channels including social media, mobile and web. MODUL University Dubai, which offers European undergraduate and MBA degrees in international management and tourism and hospitality, is backed by 100-plus years’ legacy of MODUL College’s excellence in tourism and hospitality education worldwide. The courses on offer at MODUL University Dubai are accredited by the Knowledge and Human Development Authority [KHDA].